WINTER IS HERE. No, I am not just quoting the infamous Game of Thrones dialogue but if you happen to live in North India, you that is true. With the temperature dropping below 10-degrees in Delhi and snowfall in various other parts of North India, keeping yourself warm will require more than a sweater or a jacket. Perhaps, a room heater. But in case you find the variety of choices overwhelming, we made the decision easier. Here are the best room heaters in India for 2018-19 to help you beat the cold. 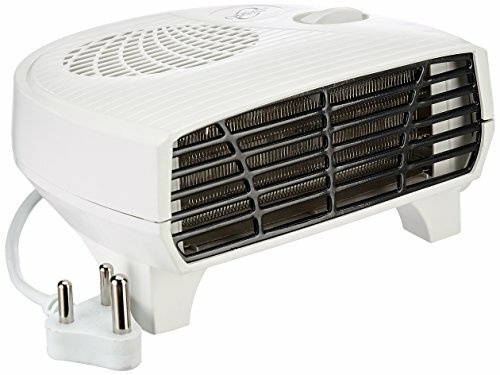 Orpat OEH Fan Heater: If you are on a budget and need something efficient enough for a small to medium room then the Orpat OEH Fan Heater is everything you could have asked for at less than Rs. 1000. Why pay 10k for a room heater? That is because when safety, comfort, and convenience are the priority, this Havells room heater is the ultimate package and here’s why. Being an oil-filled heater, the elements generate natural heat which means maintains sufficient it oxygen and humidity levels in the room without it having to be turned off. This set it and forget it heating system makes it ideal for children and old parents (enjoy a cozy sleep all night long). With 13 fins, it can heat up a room of any size in no-time. But in case you find the oil-based heating method a little slow, the PTC fan comes in handy to get quicken things up (can heat up a room within 10 minutes). There are 3 heat settings which can be easily adjusted with the twist of a knob. And even at the highest setting, the fins never become hot enough to cause burns on kids or pets if accidentally touched. Even it was dropped, the heater won’t catch fire or cause a shock because of the tilt over switch which turns off the heater automatically upon tilting at a particular angle. For further protection of your loved ones, it also comes with a rear cover and cord storage. Also, moving the heater from one room to the other is a breeze as it comes with a handle and caster wheels. Lastly, apart from being seamless at heating, easy to move and safe, there is one more area of concern when it comes to heaters and that is noise. But just like most oil-based heaters, even this is absolutely noiseless. There isn’t much to fault about this heater except that it is the most expensive heater on the list. But with the top of the line features that it has been packed with, the heater is worth every rupee. Need something a little smaller and more cost-effective? The Murphy Richards heater is your best bet and here’s why. How does it assure that? Well, with a thermal cut off feature. This means the heater will turn off on its own when the set temperature is reached. This will also keep the radiators from overheating so even they were to be touched by chance, you little ones or pets won’t end up with severe burns. Plus, it is going to be noiseless which makes it one of the best room heaters for baby in India (because those little ones deserve only the very best). Apart from that, the tip over switch guarantees utmost safety even in case the baby or someone else was to tip over the heater by automatically switching it off when it tilts more than a given angle. The 3 heat settings can be adjusted using the knob in the front while the Max/Min knob lets you set the temperature as per your requirements. And the LED indicator will let you know every time the heater turns on/off or there is a cause for concern by blinking. Oh, and yes, we understand a 9 fin and 2400-watt heater can be a little slower but all you need to do it turn on the PTC fan heater for a boost and for the heat to reach every nook and corner of the room. And lastly, in case you wanted to move it out to another room, the caster wheels ensure that does not become a back-breaking chore. On the downsides, has a lower wattage and only 9 fins which makes it ideal only for small to medium-sized rooms. But on the bright side, these ‘drawbacks’ are what make this heater the right pick for a baby room and not to mention you will also be saving a couple of thousands. If you plan to move the heater from room to room on a daily basis then you would want something compact and lightweight without compromising on heating, right? 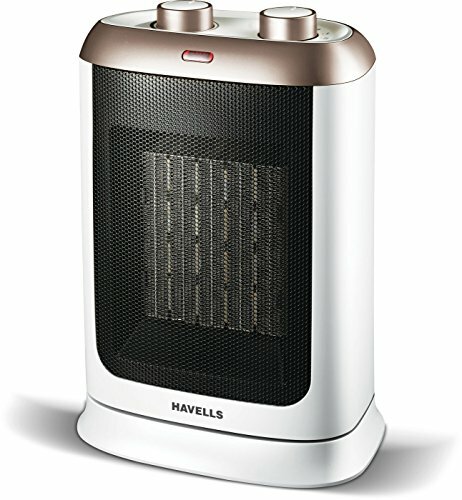 Well, that is exactly why the Havells Calido is one of the best room heaters in India. The room heater is sure to up the style quotient of your room with its sleek and unique build and white color but what really matters is the heating so let’s dig right into it. As you may have figured out by the name, the heater is a PTC (Positive Temperature Coefficient) Fan Heater. So what exactly does this mean? You can choose from 2 heat settings 1300w and 2000w which can be changed using the knobs at the top depending on how cold it really is. You would also want every corner of your room to be hot and that is exactly the purpose of the oscillation function that creates a multi-directional flow of the hot air (say goodbye to cold feet and shivering hands every time you step out of the bed). And in case you do forget to turn off the heater at night, no worries. The overheat protection feature cuts off the power supply in case the heater starts to overheat. With the tip over switch, knocking over the heater won’t result in burns or a shock as it will shut down the heater automatically once it tilts to a certain angle. There is also a dust filter that adds to the durability of the heater by capturing all the dust and dirt before it interferes with the heating. Well, considering the top-notch feature it is no surprise that the Calido is one of the more expensive fan heaters in India. Also, it not suitable for larger rooms. Plus, the dust filters will need to be cleaned up regularly to prevent clogging. On a really tight budget? At less than Rs. 1000, this fan heater will give you a perfectly warm room without burning out a hole in your pocket. The room heater is sure to up the style quotient of your room with its sleek built and white color but really matter is the heating so let’s dig right into it. This heater gives you the option of choosing between 2 heat settings (1000w & 2000w) which can be switched using the knob on the top. The 2000w is ideal for Delhi’s chilly winter nights while the 1000w should be ideal for the more moderate daytime. And even at the highest temperature, the body of the heater remains cool as a cucumber to prevent any unwanted burns. Plus, there is also the mesh grill in the front so your toddler is safe from a shock or injury due to the fan. With the thermal cut-off feature, the heater automatically shuts off when it reaches the set temperature (because your safety and comfort always come first). The durable heating element and the fan together can heat up most parts of 250-300sq. ft. room within 10-15 minutes making it a great pick for most Indian homes. Being a fan heater, there are a few obvious cons. Firstly, it is bound to be noisy but compared to some of the other cheaper models it is negligible. Also, it does not heat up every corner of the room so you would want to place the heater relatively close to you. It can also dry up the room but simply placing a small bucket of water should do the trick. All in all, for less than Rs. 1000, the Orpat OEH definitely has a design to dazzle and features that you will give you a sound sleep even when temperatures hit the lowest of lows. Well, if you are a bachelor living in North India for studies and need a room heater that is limited to just keeping you warm then a halogen heater fits the bill mainly because these heaters are often used for spot heating. This Orpat is a no frill, simple to use room heater. Just plug it in and it will have the job done in a matter of few minutes with its infrared heating without making any noise (yup, it is that effective and quiet). This mainly comes down to its nickel chrome plated reflector which will not only radiate heat in your surrounding area but also gives it an eye-catching look. And protecting you and your near and dear ones from burns while the heater is running is the thick grill mesh that surrounds the radiator. It is a 1000w heater which means there is plenty of power in the tank for small sized rooms around 100-150sq. ft. But even it that, it remains energy efficient and will hardly trickle the electricity bills. Lastly, its compact design means shifting the heater from room to room is a breeze. Pick it up and take it anywhere you like it. It also does not feature any thermal cut off so make sure you turn it off in time before it overheats. But even considering these drawbacks, for heater around Rs. 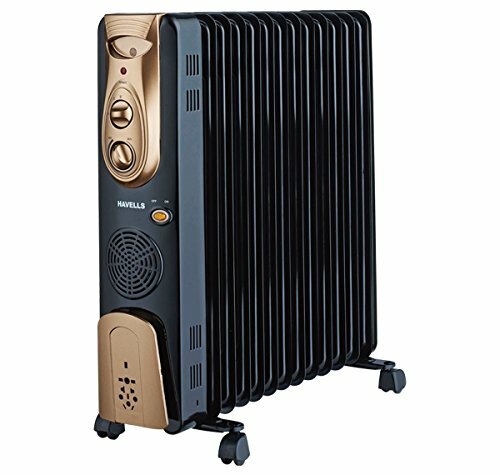 800, it is ideal for bachelors and couples in need of a cheap and portable heater. Before you buy any product it is very crucial to be clear about what features you want in your product. A room heater can be used by anyone and when it comes to buying one, not just the cost, type or model matters but these following features should also be taken into considerations. Check the number of heating elements in your heater. And the more you have the better it will be because that way it will be able to heat your room faster. If in case, you’re getting a powerful and larger heater, it will require more watts juxtaposed to the smaller one. Beware of the companies or stores those who try to sell the product claiming that they’re low on energy consumption and don’t have energy ratings. Make sure that you’re not buying any heater that comes with only one or two heat setting option. Having different heating options allow you to choose one that is suitable for your room. They say safety comes first. Try to get a room heater that automatically turns out the powder once it reaches the desired temperature. They are not just safe but will also save your utility bills. 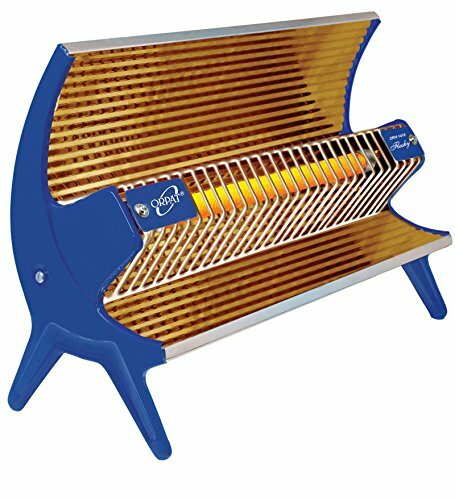 Are you thinking of buying a radiant heater? If so, just check that it is not too bright if you don’t want your sleep to get disturbed. Portability of a product matters the most. So, check if it is portable enough to be carried easily in the room wherever you want. Do you have any kids or pets at your home? If yes, you need to make sure that your heater has an added safety grill because that way the heating element will be covered externally. It would be much better if your heater has an adequately long cord because that way you can move the heater easily without using an extension board. If it is about convenience, a handle is very necessary for carrying the heater from room to room. Well, if we talk about choosing the right type of room heater, the first thing you need to do is RESEARCH. Basically, room heaters are divided into 3 main categories: Fan, electric, and radiant. But there are several different room heaters available in the market and each one is different from the other in terms of cost, features, shape, and looks. And before we talk about the best brand and cost, let’s learn about the types you can make a choice from. Having an electric heater gives you the liberty to control the temperature easily zone by zone or room by room. The best thing about an electric heater is that it will surely fall into your budget. 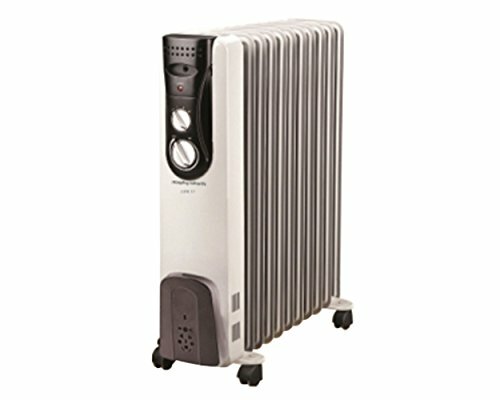 This one will take less space in your house and gives quick response than any other heater. If you’re looking for a safer option as well, this is the right choice because there’s no chance of flames, which can result in a fire. Want to save on your electricity bill? Get an oil filled heater, which is the best option for power saving as it uses oil as the heat reservoir. Do have small kids or a newborn in the house? If yes, these are primarily 4 reasons you need to get this one. The heater neither reduces humidity nor does it burn oxygen. Need not to worry if anyhow you forget to turn off the heater because it can be used a whole night. The heater will make less noise than any other type so won’t even disturb your baby’s beauty sleep. It is one of the safer options because the surface of the heater won’t heat much. The best thing about having a fan heater is that it comes with a ceramic heating element that doesn’t get extremely hot like any other model. It even comes with an in-built sensor to cut-off the flow of electricity if by any chance the heating elements get heated above 380ᵒF. The heater is small in size and is so compact that you can take it from place to place with great ease. Also, you don’t have to take care about it maintenance much and highly efficient as well. One of the best and modern room heaters that come with high-spec features, which not only make your room but also the floor of the room warm. The heater uses a different way to heat the room. It makes sure that the heat rises slowly around the room and makes it warm and cozy. Thus, it is one of the flexible and effective heating options that can be a part of your existing room. What if you can use your heater in the bathrooms and kitchens as well? Yes, it is possible with the panel heater due to its splash proof surface. Not just this but the heater even has an automatic cut-off system to avoid overheating and make the room or other areas a safer option to be in. One can even set the timer available to the electric panel that in return will save energy and your money. Do you have an air purifier in your house? If yes, you must be familiar with its working mechanism. This convector heater works in the same manner and warms up the room uniformly as it creates raise and falls evenly across the room. Thus, you can control the temperature of the room accordingly. The heater doesn’t make any noise and is really peaceful. And on comparing, it is found that a convector heater saves 10% more in energy cost than any other model.